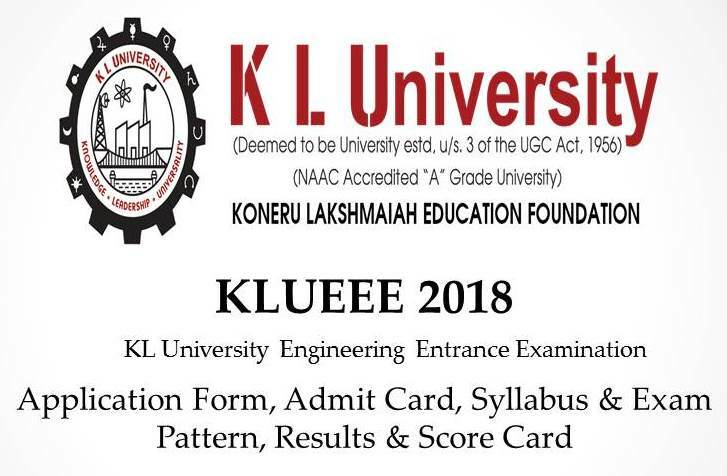 KL University conducts Engineering Entrance Exam (KLUEEE) to offer admission to the candidates in the Undergraduate courses such as B.Tech/B.E. Koneru Lakshmaiah Charities was established as a trust in the year 1980 with its official address at Museumroad, Governorpet, Vijayawada, Andhra Pradesh-520002 and started KL College of Engineering in the year 1980-81. The trust was converted into society by the name Koneru Lakshmaiah Education Foundation in the year 1996. The Koneru Lakshmaiah Education Foundation society was recognized as Deemed to be University. In short Koneru Lakshmaiah Education Foundation is named as K L University. The candidates who cleared his/her 10+2 or other equivalent examination with an aggregate of 60% marks and above will be eligible to participate in the KLUEEE Exam. Candidates should pass the qualifying exam with mandatory Physics, Chemistry and Mathematics. In this program, B. tech in Bio-Technology is also included. In the B. Tech with Bio-Technology only, the subjects will be Physics, Chemistry and Biology. For B. Tech including Bio-Technology Physics, Chemistry and Mathematics are required. For B. Tech only Bio-Technology Physics, Chemistry and Biology subjects are required. For the registration process the candidates have to enter the details like Education, Personal details, and Communication details etc. Candidates must upload the scanned copy of the recent photograph and signature in valid format. Applicants must pay Rs.900/- for the Application of the Exam KLUEEE via online mode. Application fees will be paid through various methods i.e. Credit Card or Debit Card and through Net Banking. Once the payment is completed, candidates will receive a confirmation message on the mobile and the email account within 48 hours of form submission for the KLUEEE Exam 2017. The nature of the KLUEEE Exam is objective. There is no negative marking concept. For each correct answer, 1 mark will be awarded. There are three sections in the examination. There are total 160 questions in the exam paper. The total exam will be of 160 marks. Admit card of KLUEEE Exam will be uploaded in the second week of April. The admit card will be available only in the online mode and can be easily obtained by using the application number and date of birth. KL University has announced the result of KLUEEE in May. The rank card will be published soon after the declaration of the result. The aspirant can download their rank card by using the necessary login details. Merit list will be published later on which comprises of the names of the qualified candidates. These qualified candidates will be then called for the counselling procedure. Counselling is being held by KL University from the 2nd week of May. Counselling for rankers of TS EAMCET and qualified CBSE candidates was held on May. KLUEEE Counselling is the procedure through which candidates are allocated seats for admission into the respective engineering programmes at KL University. It is mandatory for candidates who have received call letters to attend KLUEEE Counselling in person, as per KLUEEE Counselling Schedule. Only those candidates have been sent call letters who have successfully secured valid scores and meet KLUEEE Cut-off. Moreover, the seat allotment process will also be determined on the intake capacity of the university and total number of qualified applicants. During the counselling process, applicants are required to produce originals documents of required certificates along with their attested copies. Candidate are required to pay below mentioned amount as Admission Fee, Caution Deposit and Tuition Fee in the form of Demand Drafts (DD) drawn in favour of KL University payable at Vijayawada.